Wyrill Crawford is a famous name in the old town. Its a name passed down over several generations. This article was sourced by Vanessa Milner of Scarborough Archives Group. It appeared in the Scarborough Evening News on Wyrill Crawford's Golden wedding anniversary. One of the best known and most popular of Scarborough's old fishermen celebrated his golden wedding on Sunday. On Novemebr 8th, 1875, the marriage took place at Albermarle Baptist Church, by the Reverend Mules of Wyrill Crawford, to Martha Hannah Fleet. Both Mr and Mrs Crawford are now 73 years of age and they have spent their lifetime in Scarborough. When seen this (Monday) morning, Mrs Crawford at their home in Wilson's dwellings and Mrs Crawford at the Lifeboat House, both appeared hale, hearty and cheerful. A chat with Mr Crawford turns the clock back to the old yawl fishing days. Hazardous as is the seafaring life now, how much more precarious must it have been in those times. The seamanship displayed in bringing these broad-beamed sailing vessels through the wintry seas has never been beaten. WENT TO SEA AS A BOY: As a lad of about twelve Mr Crawford first went to sea. The ship, he believes would be the General leith, owned by Mr Wm. Possitt, and they were engaged in herring fishing. Throughout his long career Mr Crawford remained true to his calling of fisherman, and when the old yawls gave place to drifters he went fishing in cobles. He retired from the sea some seven or eight years ago, and was at that time owner of the coble Rescue. To reccount the narrow escapes he had at sea would requie a book. The yawls, which were comparable in size to drifters, stopped at sea about a week, salting the herrings as they were caught. Half humourly Mr Crawford mentioned one of his experiences. The yawl Magnetic, with 24 men on board, including Tom Owston, Geo. Clarke, and himself, was as near port as just off by the Bathing Pool when a gale came over. The efforts of 24 men were unavailing against the elements, and the boat had to go to Bridlington Bay before she could come home. LONG SERVICE IN LIFEBOATS : Mr Crawford has seen lifeboat service in the Lady Leigh, the three Queensburys, and the reserve boat, Edward and Lucilla. Now, when his days of active service are over, he is just the right man for the position as caretaker at the Lifeboat House, and there he shows the vessel to visitors, who, if they are lucky, may hear of some of his exploits. The first event in local lifeboat history which he remembers was when the Amelia put off to the Coupland. He was but a boy at the time. One of the worst of trips in which he actually took part was on December 15th, 1886, when the boat Rainbow was wrecked. 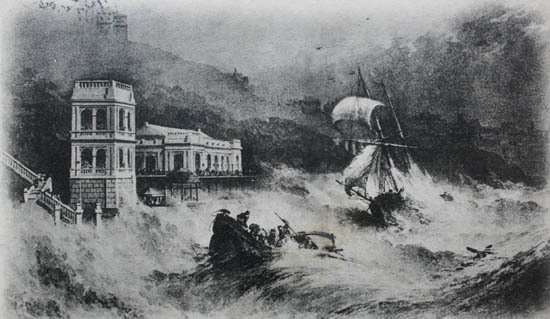 Hundreds watched the rescue of the crew from the shore, and on several occasions the lifeboat was lost from sight in the huge waves, and her loss was feared. Mr and Mrs Crawford have three sons and four daughters, all living in Scarborough. the eldest son is Mr Wyrill Crawford partner in the coble Reliance II. The other two sons are trawler skippers, whose capable services have been eagerly sought. Mr Daniel Crawford is skipper of the Star of the Empire, and Mr Walter Crawford is skipper of the Star of the the East. Mr Wyrill Crawford, Jnr, is carrying on his fathers lifeboat service, he having been bow-man for nine or ten years. Picture above : Wyrill Crawford remembered the tragic lives lost on the Amelia as it tried to rescue the crew on the stricken Schooner the Coupland. He was merely a boy. Later he was to be one of the lifeboats crew.